Samsung is preparing to include an in-display fingerprint sensor with its next flagship smartphone range, the Galaxy S10 and Galaxy S10 Plus, set to launch at the Mobile World Congress tradeshow in February 2019. But the next-generation handsets might not be the only device that includes this nifty new technology, which allows gadget owners to place their finger onto a glass display to authenticate their identity. According to a new patent filed by Samsung, the fingerprint sensor would be embedded in the lower half of the smartwatch display. Like on flagship handsets, the fingerprint scanner will likely be used to unlock the device, access sensitive data held in applications like banking apps, and authenticate contactless payments. As it stands, Galaxy Watch owners have to set a four-digit PIN to use contactless payments via NFC. 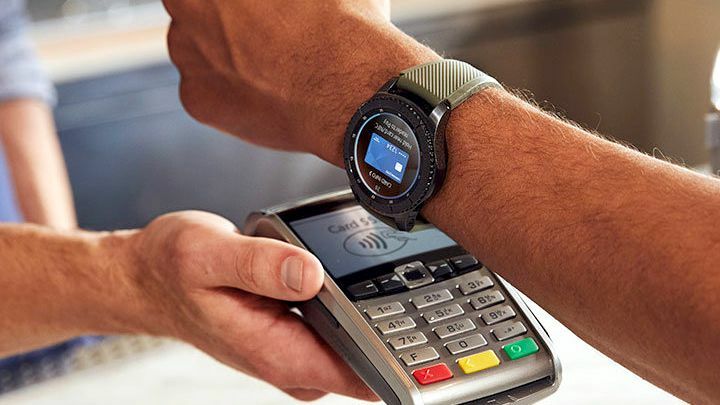 If the PIN is entered incorrectly 10 times, any credit or debit cards in your Samsung Pay account will be deleted from the Galaxy Watch as a security measure to protect against fraud. Using a fingerprint sensor is more secure than a PIN, and means the experience across the latest Samsung-branded smartphones and wearables are the same, since users can already use their fingerprint to authenticate payments on its handsets. Like the Galaxy Watch, rival wearable Apple Watch allows users to unlock the wearable with a PIN. However, it also can be unlocked using the Touch ID fingerprint scanner or Face ID facial recognition system on the iPhone that is paired with the Watch. Once the smartwatch is unlocked, it can be used to make contactless payments using Apple Pay. As soon as the Apple Watch no longer detects that it is in contact with an arm, it will lock the device – disabling the ability to use Apple Pay until it is unlocked again. According to the patent, which was spotted by technology blog Patently Apple, Samsung hopes to embed a fingerprint scanner beneath LCD, LED, OLED, and e-ink panels. Meanwhile, the fingerprint sensor could include a capacitive, a pressure-sensitive, a resistive, an infrared, or an ultrasonic touch panel. The latter is widely-tipped to be the sensor included in the Galaxy S10. It is expected to be more accurate and reliable, compared with the optical sensors used in earlier smartphone models. It's worth taking the in-display fingerprint scanner on the Galaxy smartwatch with a healthy pinch of salt. After all, Samsung patents a swathe of different technology and features that never leave the R&D department, so it's possible this biometric sensor will never make it into a final product. Nevertheless, the convenience of a fingerprint scanner would likely be a welcome addition to those who own a Galaxy Watch and frequently use the smartwatch for contactless payments.